Yi...what?? I know. Yixing. 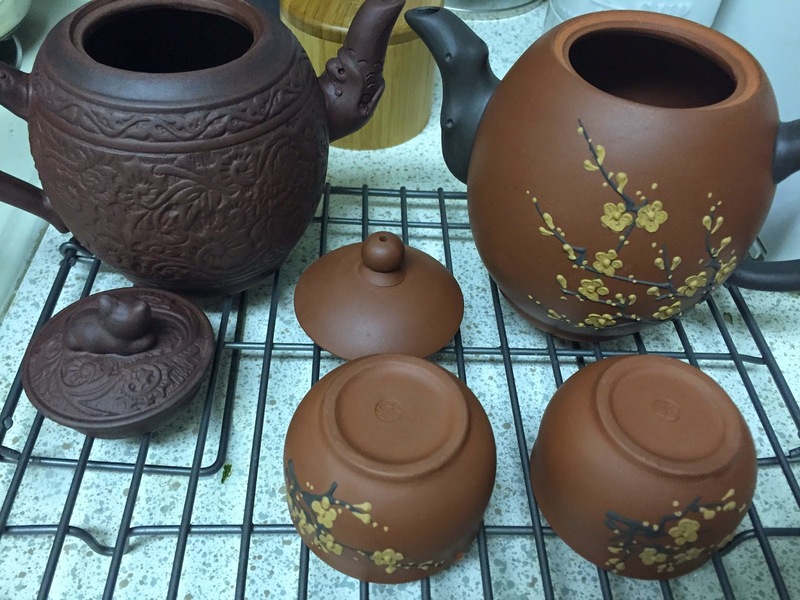 Yixing clay vessels are (according to many tea connoisseurs) the best way to brew tea. I know it looks like I only collect ceramic tea sets but I collect all things tea. From Teavana. 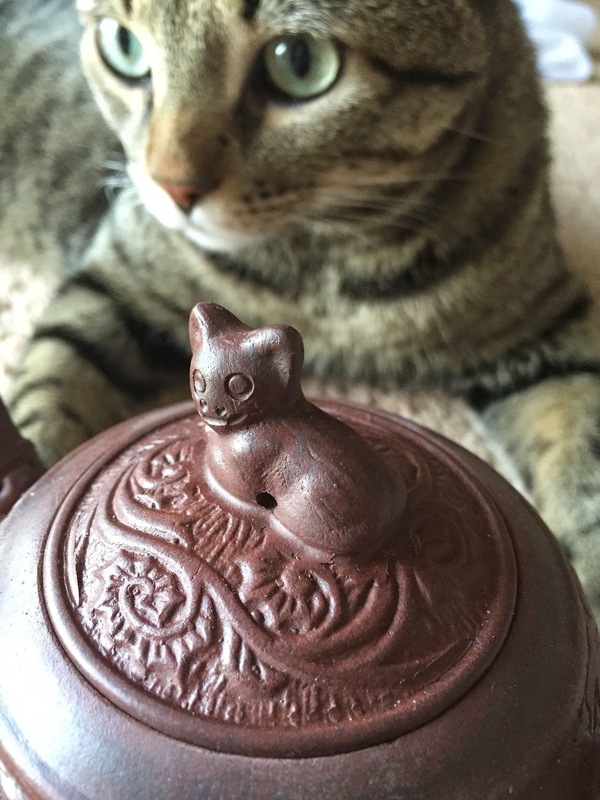 The description on the site says "Kitten Yixing Teapot" but I don't think that is a cat. The one in the back is obviously a cat. The one on the teapot looks like part shisha and part nightmare. Now only $24.47! For some reason it is not sold out yet. Yixing clay is from a region near Yixing in the Jiangsu province of China. Depending on the type of clay, the colors may be purple- red, red or brown. Metals incorporated in the clay can form variations like blue or green. 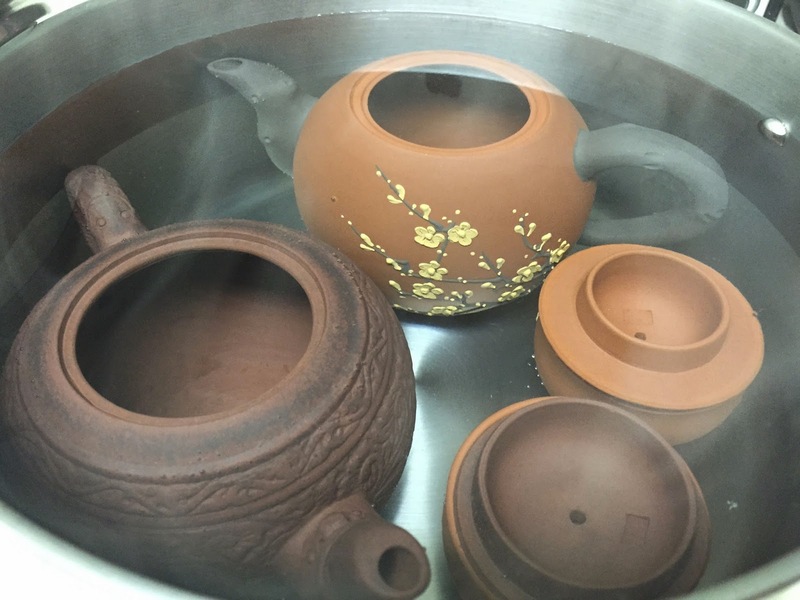 The completed clay ware is not glazed, leaving a porous surface that absorbs flavors and aromas, giving rise to complex flavors, ultimately enhancing your tea experience. You can buy yixing clay pots on Amazon or Ebay. I recently purchased these from Teavana during their fall sale (still ongoing). This was a great opportunity for me to add to my cat collection and my teapot collection and also show you how to season yixing teapots! Multitasking! So, first of all, yixing teapots should only be used for one kind of tea since they absorb all flavors and aromas. I have heard that if you intend to only brew high quality tea in one pot, you should not brew low quality of the same tea in the same pot as the lower quality stuff can obscure the high quality stuff. Like the heirloom cast iron skillet you inherited, you must season yixing clay pots so that it takes in your designated tea flavor. My teapots arrived all dusty with bits of unfinished clay bits rattling around inside. I was a bit surprised that Teavana did not leave any instructions on seasoning the teapots inside my boxes. Still, I have read that you can just repeatedly boil your favorite tea and with each steep, the tea flavor should become more developed and complex. I am not sure which method is better, but this is how I learned so I will share my way with you. If you don't have time to do this and you just want to experience your new teapot right away, by all means, do it. I do recommend washing it thoroughly with water before use even if you don't have time for all these steps. If you can wait about 24 hours, then read my instructions below. 1. Clean your pot. 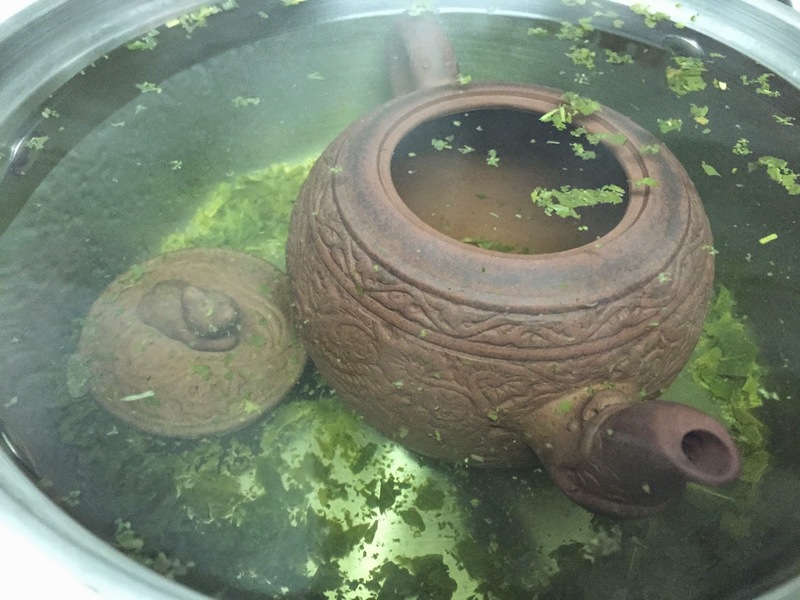 You should NEVER let your teapot come in contact with detergents of any kind. Again, it absorbs things so you don't want it absorbing soap. Wash with a new sponge (that does not leach color) or towel under running water. I used a thick wad of paper towels. 3. In the meantime, fill up a large pot with CLEAN water. My home has the hardest tap water so I used bottled water. Boil the water. 4. When the water has reached a rolling boil (see picture for definition of "rolling boil"), lower the heat to medium-high. 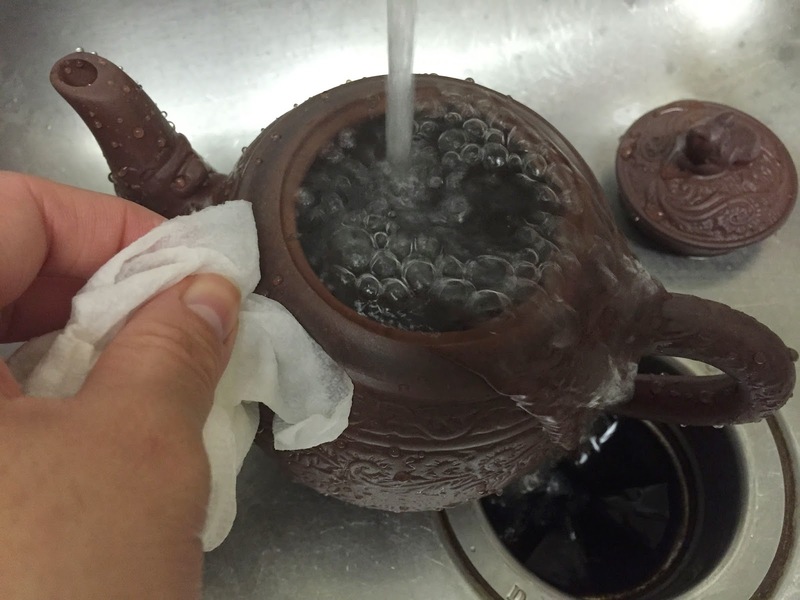 Gently lower your teapots into the water. You can put a slotting spoon at the bottom so your pot doesn't come in direct contact with the bottom of the pot. I did not. 5. The water should be gently simmering at this point, with the teapots inside. You will hear them rattle but as long as the pots and lids (and cups in my case) are not banging against one another you should be fine. If your teapot is antique and valuable, separate the lid and cups in different pots. Or reduce the heat so it doesn't boil hard. Let the teapot boil for about 15 minutes. Some people recommend longer (up to 1 hr). See the tiny bubbles? At this stage I heard a lot of rattling. 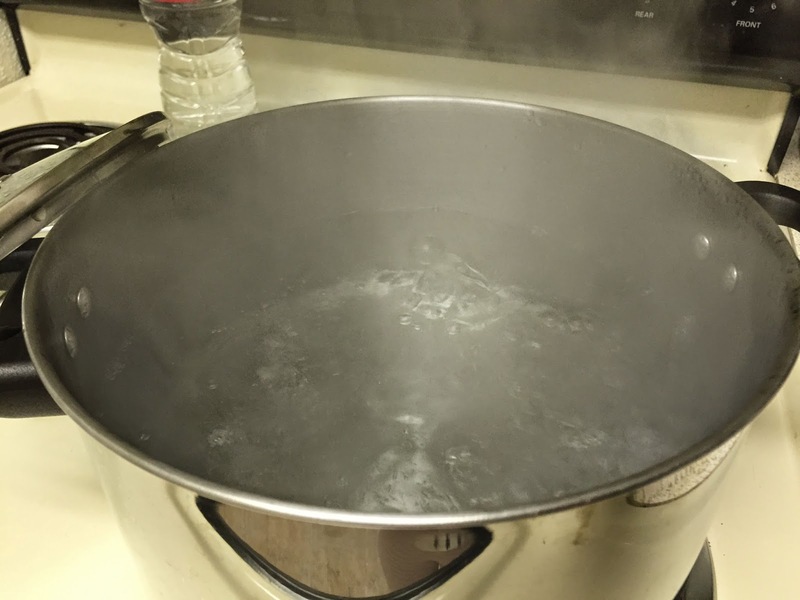 Since I squeezed too many pots and cups and lids in this pot of water, the heat was on fairly low to prevent my wares from smacking into one another. 6. After boiling, take pot off the heat, allow the water and pot to cool down (1 hr). Carefully, take out the pot and dry on a rack. Let it dry completely before proceeding to the tea steeping stage. 7. While the pot is drying, boil the same amount of water. 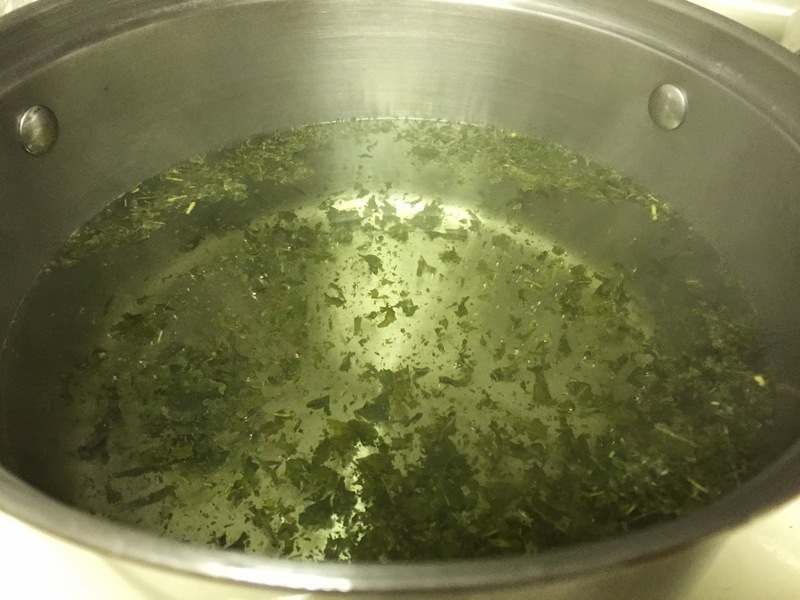 Once it reaches a boil, add the designated tea leaves for this pot (1-2 tsp). I am adding Ito En's sencha. 8. Then add your dried teapot. Let it gently boil for 15 minutes (or longer...up to 30 minutes). 9. Take pot off the heat, cover and let it rest overnight. Doesn't it look like some sort of antique buried at the base of the sea? 10. The next day, take pot out, rinse with warm, CLEAN water. Set out to dry on a rack. To clean, always clean it with just water. Do not expose it to oils. Do not be lazy about leaving tea leaves in the pot. You WILL get mold. Just rinse it off with water and let it dry. Like all things treated with love and care, your teapot will take on a lovely sheen and greatly enhance the flavors of your favorite tea with repeated use.